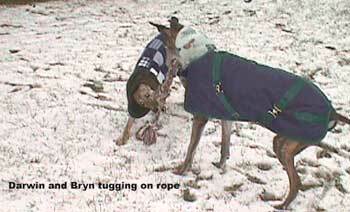 Bryn came to GALT as an owner release from someone who knew she would not be able to help Bryn as was needed - it was a very difficult decision to make. 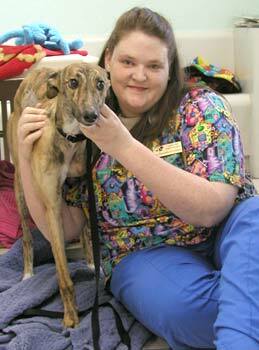 We actually could call "her" the first Guardian Angel for Bryn; Shannon Gregorich, daughter of a GALT volunteer, worked in a vet clinic where the owner took Bryn and asked if she knew of a greyhound adoption group. 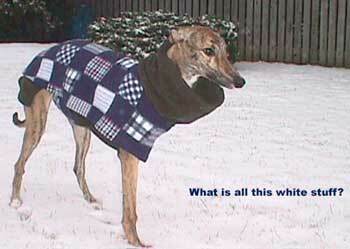 Shannon got in touch with GALT, and that is where we come in. 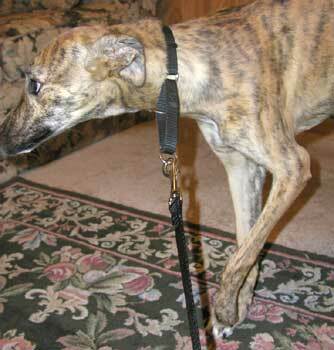 Shannon fostered Bryn for several weeks while second opinions were obtained regarding Bryn's leg. 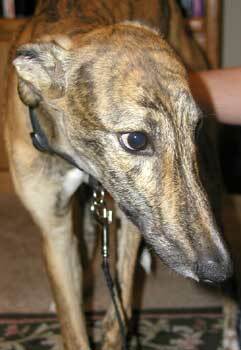 Dr. Jeff Ellis of Preston Park Animal Hospital, performed Bryn's surgery, and was assisted by Dr. Amanda Florsheim. 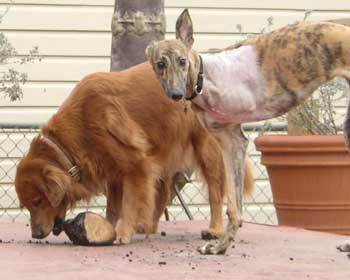 Dr. Florsheim has a dear friend from vet school at Texas A & M who has, coincidently, two 3-legged greyhounds  a 6-year-old male, Darwin, whose leg was amputated at Bryn's age and another older male, Renegade, who is 10 and has osteosarcoma. 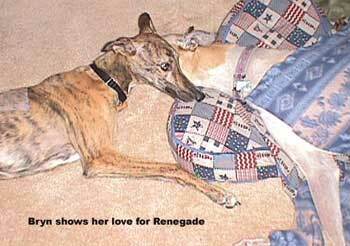 Because of Renegades cancer, they had been talking about adding to their family, sooner than later. A dialogue with Drs. Beth and George Rodney, who now reside in Baltimore, Maryland, began, and soon we received their adoption application. After her surgery Dr. Florsheim and her husband, Rob, fostered Bryn, and even with just keeping her a short time it was difficult to let her go! Fred Busche, GALT's Transportation Coordinator, began the task of getting Bryn's airline "ticket" and transportation arranged. Because of the cold weather here in Dallas, as well as in Baltimore, daily temperature checks were monitored. Finally it was decided that Monday, January 12 would be *the day*  Fred picked up Bryn from the Florsheims, and off they went. 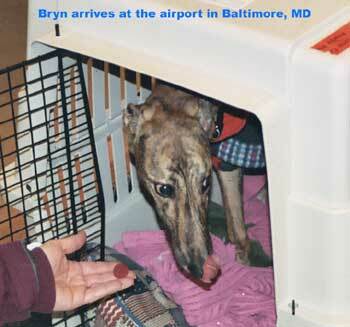 Bryn finally arrived at 5:30 pm in Baltimore to her awaiting family! Pictures tell the whole story  from playing with the Florsheim pups, to saying goodbye, to saying hello and now romping with her new brothers! Yes, Bryn does have many Guardian Angels  her first owner, Shannon Gregorich, Dr. Jeff Ellis and Dr. Amanda Florsheim and now her new parents  Beth and George Rodney! GALT appreciates the donations to the Miss Mesa Fund for Bryn from all her other Guardian Angels! THANK YOU! Bryn came to live with us a little over a week ago. Though nervous from her long trip, she was determined to win over our two boys. 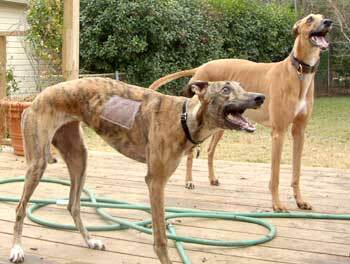 Darwin is our 6-year-old brindle and Renegade is our 10-year-old fawn; both are also amputees. Darwin lost his right rear leg at 6 months of age due to birth defects and Renegade had his left front limb amputated 2 months ago due to osteosarcoma. So, Bryn fits right in here. 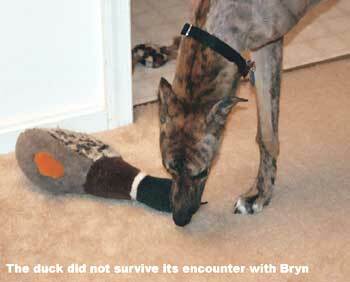 Bryn definitely passed the sniff test, but Darwin was just too excited to know what to do that first night. 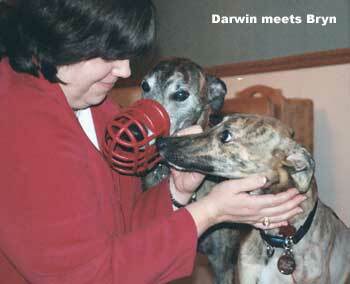 Over the next few days, Bryn grew more bold and she and Darwin became inseparable. They play and chase and nibble and even pounce. Renegade is pretty reserved these days, but Bryn has enticed him into a few games of "tag". It has been great to see him playing again. You can even see the sparkle in his eyes. What a gift Bryn has given us! 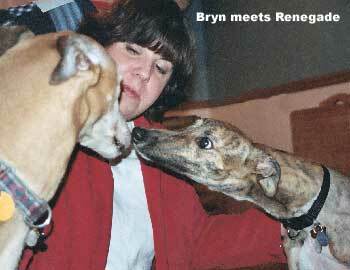 Bryn is still nervous at times. She was not familiar with stairs and, although she has learned to run up them, she is still afraid to go down. She gets nervous when we put on her coat and leash to take her in the car. She must think we might take her somewhere and leave her. We've told her she's here to stay, but we don't think she believes us yet. Bryn has settled into the routine and has made herself at home here. She has pulled out every toy in their rather large toy basket and has picked her favorites. 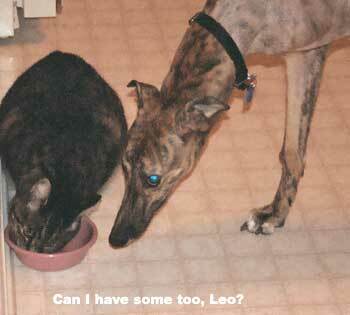 She tries to play with the cats every day, and, despite her persistence, we think it's a lost cause. She's taken her place in the musical bed game that occurs every night in our room and woke us up early Saturday morning playing with Darwin. We adore her and know she was meant to live with us - even the cats don't seem to mind (except when she bites their ankles).